Camilla - Erika Campbell: Who said wallpaper was just for walls??? Who said wallpaper was just for walls??? April flew by as quickly as it came for me, I can’t believe we are sitting in May already! My crafty challenge for April has kind of grown arms a bit as I’ve found too many things I want to do, so this craft challenge is a special 2 month one and will last until the end of this month. So what is it??? 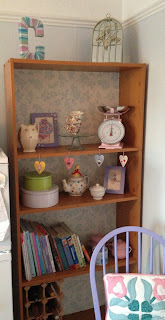 My latest craft is...........Crafts and DIY for your home........ok so not exactly a new craft or particularly refined but this is what is exciting about this one! Does anyone else buy crafty or homes magazines see loads of things they like and then cast aside the magazine into the dark depths of the magazine rack to gather dust? Or like me do you pile up your magazines, then every so often go through and cut out/pull out the stuff you are interested in, create another pile and then leave that. Then after sometime find a use for the image you have kept or decide to do the project you kept? Well that is most definitely me, I have various piles for different crafts with good intentions to make “at some point”. Ripped and cut out future project ideas! The idea for this month came when I decided I wanted to revamp a chest of drawers we got when we moved into our house 2 years ago. May I just mention despite purposely buying plain unpainted furniture with the view to paint, it has still taken this long to happen! 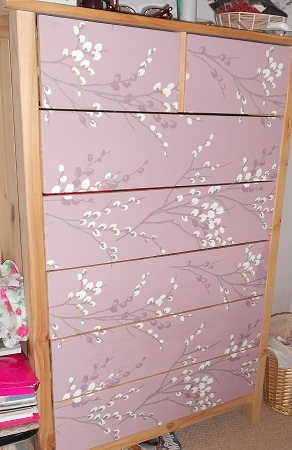 But I didn’t just want to paint my furniture I wanted to stick wallpaper on it and paint it. I’d seen this done in various magazines and thought it looked really effective. Two years certainly gives you plenty of time to plan and I had already managed to accumulate the chosen Laura Ashley wallpaper (reduced bin!) and handles of my choice, it was now just time to get the project underway. In true Camilla fashion this project is still very much underway but here is how I have got on so far. 1. Starting with a chest of drawers I gave them a quick clean with a damp cloth to wash off any dust or dirt. I decided to turn the wallpaper horizontally so that there was no joining line down my drawers, I quite liked the way this particular paper looks horizontally. I started out by measuring the width and length of the drawers and roughly cutting the paper down to size. I was generous and left excess paper, it is better to do this than be short, all you need is a sharp craft knife to trim it to size. With my wallpaper the width of the paper would cover 3 rows of drawers so I cut all my bits out and then blu tacked them on the drawers to see what it looked like. It is also easier to trim the paper down to size when it is on the drawers as you can use the edge of the drawer as a guide to run your craft knife along. 2. Once happy with the paper blu-tacked on and trimmed I took it off and covered the back of the paper evenly in pva glue. You need to work fairly quickly as the glue won’t take long to dry. 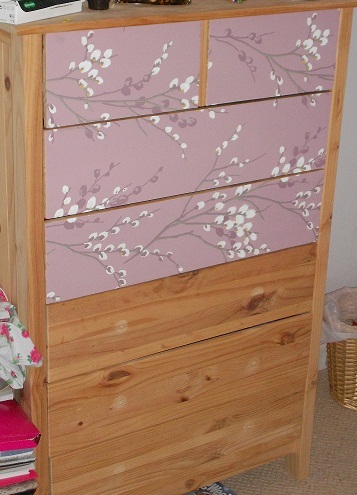 Carefully place the wallpaper onto the chosen drawers and smooth out any air bubbles. If your paper is slightly too big just use your craft knife to trim to size, et voila! 4. Lastly you need to coat your wallpaper with varnish to seal it in and then decide on your handles! I found these beauties in the sale section in a local gift shop for 99p each. Total cost for the handles was £11.88, bargain considering some handles retail at £2.50 each or more! To fix the handles you will need to make a hole in the front of the drawer where the screw will go through. Use the existing hole as a guide by poking a pointed implement from the back of the drawer to the front. 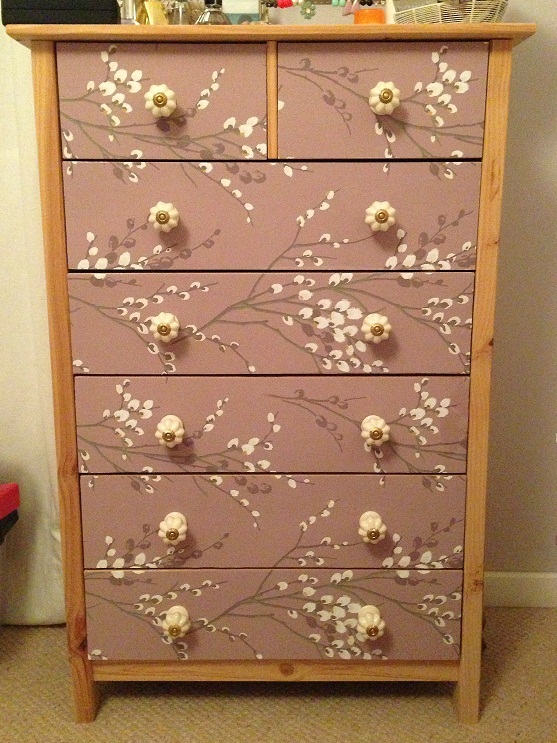 Chest of drawers or piece of art? Pretty handles, a steal at 99p each! There you have it! 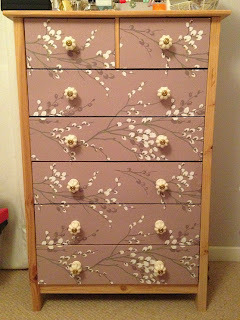 A truly unique chest of drawers which can totally transform a room. Now all I have to do next is paint the wood! I didn’t stop there, I decided to spread my love of wallpapering to the kitchen. 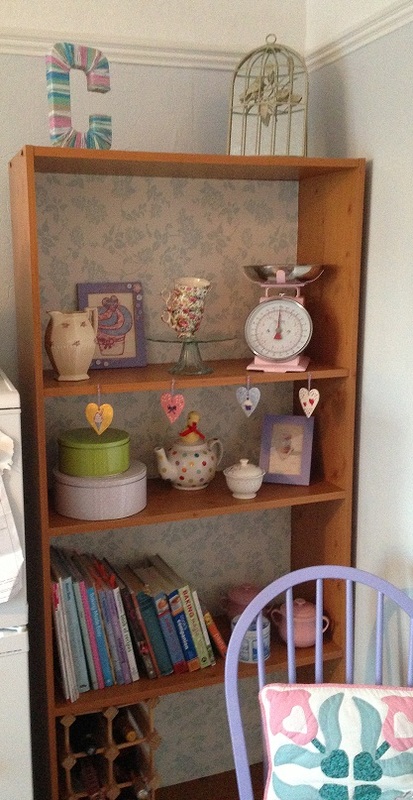 See below how I managed to liven up a bookcase with a little wallpaper, pva glue and by displaying a load of my favourite items. I still have plans to add more but I will tell you about that later as more crafty DIY makes pop up over the next few weeks!